The Annie Moses Band will headline the Samford University Legacy League’s scholarship celebration April 27. The event, celebrating Samford’s 175th anniversary, will be held at Mountain Brook Community Church in Birmingham. Formed in 2002, the Annie Moses Band is a family affair. 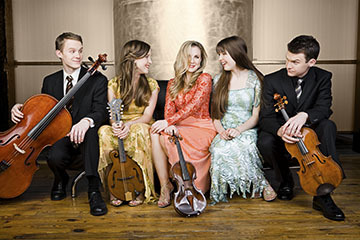 The Juilliard School–trained siblings have performed around the world in venues as diverse as Carnegie Hall and the Grand Ole Opry with their unique blend of jazz, folk and classical genres. The band’s 90-minute concert will conclude the scholarship celebration, an annual event that provides scholarships for students with significant financial need and challenging circumstances. Standard reservations are $100 ($50 tax-deductible), and include a seated dinner and the concert. Deluxe reservations are $135 ($70 tax-deductible), and include a reception with band members, seated dinner, preferred concert seating and an event photo. Tables for eight or 10 with standard or deluxe reservations also are available. The reception begins at 5:30 p.m. Dinner will be served at 6:30 p.m., followed by the concert. Reservations can be made online. For more information, call 205-726-2807.